Line Up: Pete Lee (Vocals, Guitar), Phil Lee (Bass), Steve Brewer (Drums). Releases by RilRec: RR 012 (CD) "Badge Of Honour", 05/2009; RR 022/023 (CD/LP) "Class Of 76", 10/2011. Sie wurden von Bands wie The Clash, The Boys, Generation X und The Jam inspiriert. Sie kombinieren ihren Sound mit der Energie von Bands wie My Chemical Romance oder Social Distortion. Und dennoch benötigen die GUITAR GANGSTERS keine Vergleiche, da sie seit 22 Jahren ihren eigenen hymnenhaften melodischen 77er-Punkrock in 18 Ländern (unter anderem Brasilien, Malta, USA) auf die Bühnenbretter tragen. BADGE OF HONOUR ist neben zwei Livealben und drei Singles das achte Studioalbum der Londoner Punkrock-Legende. Im Gegensatz zu manch anderer UK-Band im fortgeschrittenen Alter gelingt es den GUITAR GANGSTERS immer wieder, auch auf Platte eine mitreißende Frische zu transportieren. BADGE OF HONOUR ist ein weiterer überzeugender Beweis dafür. Guitar Gangsters take their inspiration from the likes of The Clash, The Boys, Generation X, and The Jam from the first UK wave of punk. They combine it with the power and attitude found in stateside bands like My Chemical Romance and Social Distortion. Although they don´t need any comparisons. 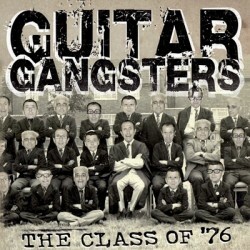 In their 22 year history Guitar Gangsters have released 8 studio albums, 2 live albums, and 3 singles. They have played in 18 countries including the USA, Brazil and Malt. They have toured the UK with Stiff Little Fingers and in Europe with The Lurkers, 999, and most recently TV Smith. Guitar Gangsters have featured on the line up of almost every punk festival in Europe. Still Guitar Gangsters play with the attitude and urgency that moved them to pick up their guitars in 1987 – still they play as if their lives depended on it, or at least the future of rock’n’roll as we know it.